They’ve been on the entry list for Houston for a couple of weeks, and now it’s confirmed in a press statement: having driven for the AF Corse (factory) team at Silverstone last weekend (where Melo won, with Matteo Bobbi, while Salo came third, behind the lead Ebimotors Porsche), ex-F1 man Mika Salo and factory test driver Jaime Melo will be in the Risi Competizione Ferrari for the balance of the American Le Mans Series season – which presumably means they’ll miss a couple clashing of FIA GT events. Melo drove for the team at Sebring, where the Risi Ferrari finished third on its debut – a race it looked like winning. That unfortunately means no drive for Ralf Kelleners and Anthony Lazzaro. The long arm of Jean Todt has allegedly been at work here. “We know that Jaime Melo is one of the fastest young drivers in the GT2 class in ALMS,” continues Risi. “He proved this by his times at Sebring, and by setting the lap record for the GT2 class. He is a splendid young talent, thoroughly professional on and off the track. Melo blended instantly with our team and he delivered lap after lap at Sebring, in one of the most tightly contested races in modern history. We’re still convinced that Melo’s Christian name is pronounced exactly the same as the French “j’aime” – because that’s what he told us at Le Mans in 2004, when he made his debut there in a JMB Ferrari 360. 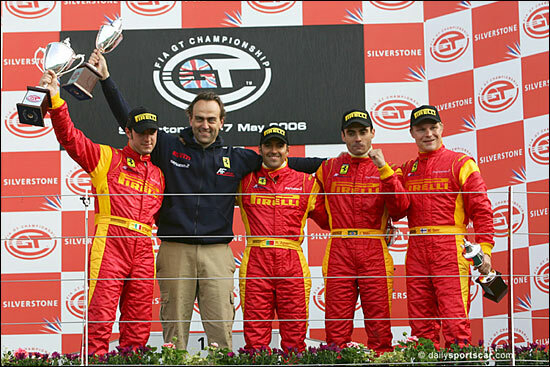 Here they are (Melo and Salo - on the right) on the podium at Silverstone on Sunday afternoon - with AF Corse Team oener Amato Ferrari. “To be suggested for such an important position is personally flattering, but I believe it is the result of the success that the American Le Mans Series has achieved. Don Panoz has entrusted me with the stewardship of his varied motorsports interests including Elan Motorsports Technologies, which is designing and building the next generation Champ Car – the Panoz DP01.